Sure chef Troy Guard just opened Los Chingones and Sugarmill, but that doesn’t mean he’s resting on his restaurant laurels. Instead, he will open his largest concept yet in February. Guard & Grace (his daughter’s moniker) will be a 9,000-square-foot modern American steak house at 1801 California St. The new space will offer private dining areas along with Denver’s largest patio with a fire pit, an expansive raw bar, wood burning oven and exhibition kitchen. Meanwhile, Guard’s TAG Burger Bar at 1222 Madison St. is throwing its annual Taste of the NFL Fundraiser where a $25 donation to the Food Bank of the Rockies gets you beer, specialty cocktails and wings during the game on Sunday. The January Burger of the Month at TAG Burger Bar is the New Year’s Resolution Burger: A veggie patty made from vegetable protein, edamame, quinoa and mushrooms on a whole wheat bun with a red beet gastrique, golden beet strings and brussel sprout leaves. 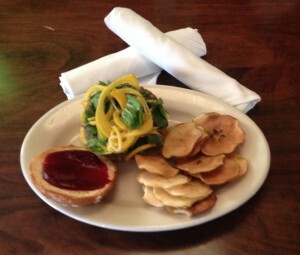 Served with apple chips or French fries for $13. Proceeds from this month’s burger go to Angel Eyes, an agency that provides free grief support services to anyone experiencing the sudden, unexpected loss of an infant or toddler.